Hi everybody! I’m going to introduce you to the Korean snack Eomukguk today. Eomuk are fish cakes and guk is the Korean word for soup, so this recipe is fish cake soup with anchovy stock. 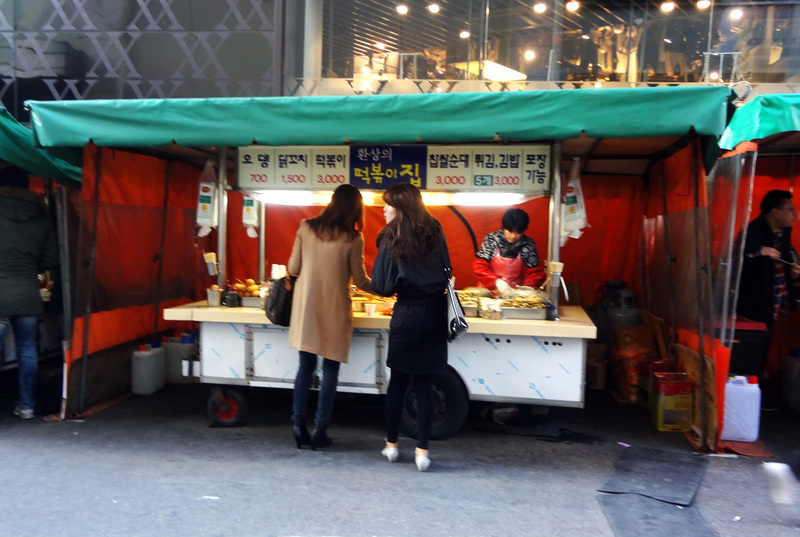 If you’ve ever been to Korea, you’ve probably seen this food being sold by street vendors. 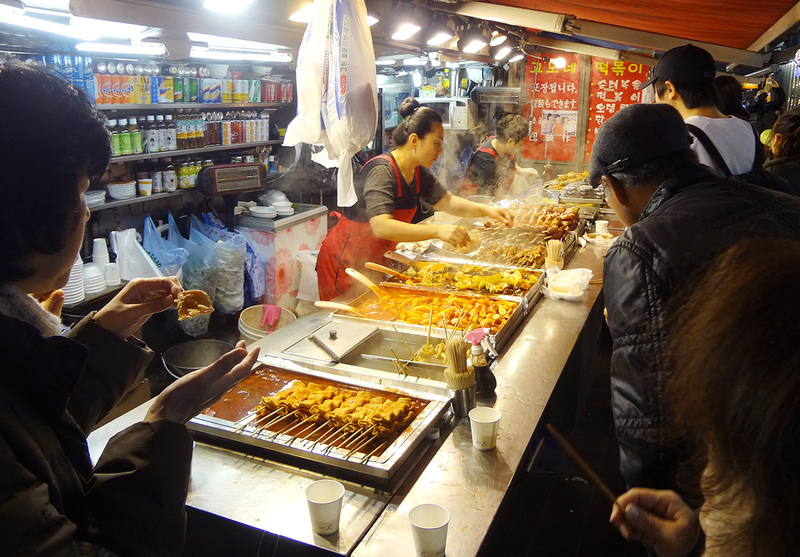 You’ll always see people gathering around their steaming carts in the wintertime, enjoying the sizzling eomukguk. For each one I ate, I’ll have an empty skewer in my hand. So it’s easy to calculate! I show the vendor my skewers and they tell me the price. This way, I can just eat as many as I like, comfortably, and worry about paying later. What I’m showing you here is an upgraded version of Eomukguk. Most street carts only use low quality fish cake made with lots of starch instead of fish, but I’m using gourmet fish cakes in this video. 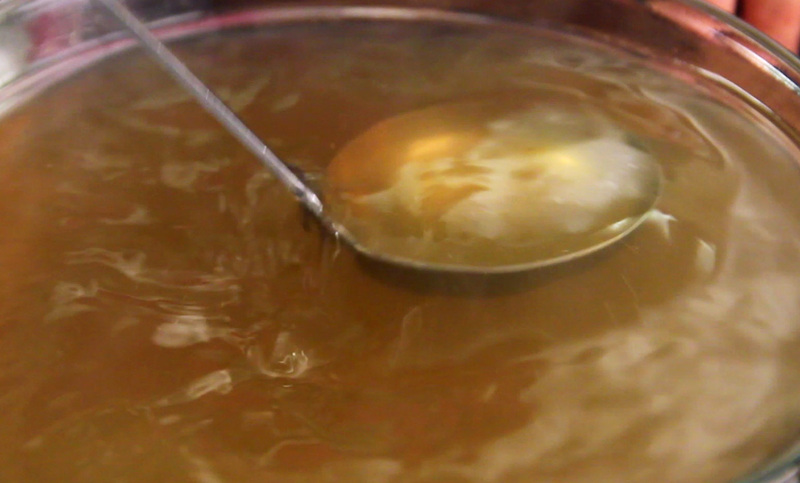 I worked a long time to perfect this broth and make it as delicious as I could remember it being. I tried adding dried shrimp, mussels, dried mushrooms, but found that a simple, well-seasoned broth gave me the best flavor. If I ever develop a better broth I’ll let you know, but in the meantime, make this for your family, friends, or yourself, and pretend you’re on the street in Korea. Put the water in a large pot. Peel the radish and cut it into 1 inch cubes (or balls) and put them into a soup strainer (gukmulmang). Put the strainer into the pot. If you don’t have a soup strainer, you can use soup sock or cheese cloth. Add the the onion, dried kelp, and the leftover bits of radish (including the skin) to the pot. Bring it to a boil over high heat for 20 minutes with the lid closed. While it’s boiling, cook the anchovies in the microwave for 1 minute (or sauté without oil in a pan for a few minutes). Add the dried anchovies to the pot and boil for another for 20 minutes, uncovered. This will allow some of the fishy smell of the anchovies to evaporate. Remove the pot from the heat and strain. Take out the cooked radish cubes from the soup strainer and set aside. You’ll get about 8 cups of stock. Add the soy sauce and salt and mix well. Stick 5 or 6 fishcake pieces on a skewer, and make 4 or 5 skewers. Put them in a shallow pot and add enough broth to totally submerge the fishcakes. Bring to a boil for 10 to 15 minutes until the fishcakes are soft. Combine soy sauce, hot pepper flakes, green onion, green chili pepper, garlic, sugar, sesame oil, and sesame seeds in a small mixing bowl. Prepare individual bowls and plates, a ladle for the soup, and a small spoon for the dipping sauce. 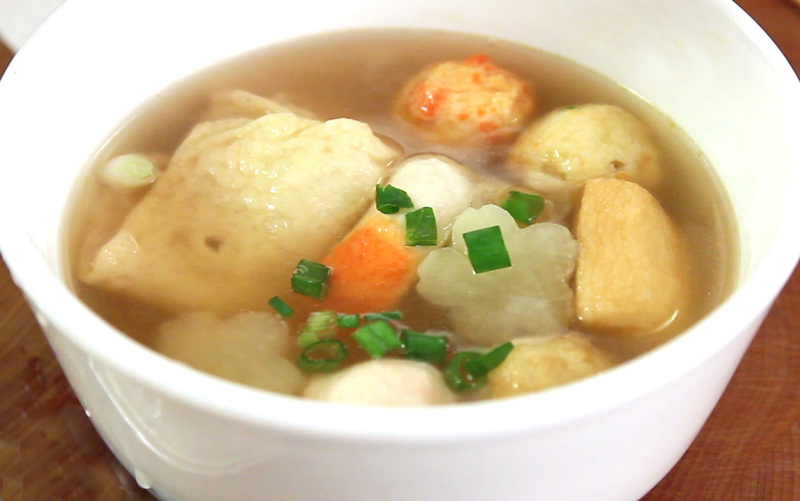 Serve hot and scoop some of the soup, with a skewer, into a bowl for each person. 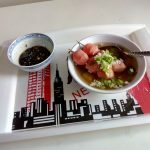 When they eat a fish cake from the skewer they can put some dipping sauce on it first. Delicious! Enjoy the recipe! Let me know how it turns out. Posted on Wednesday, January 2nd, 2013 at 4:34 pm. Last updated on October 5, 2014. Posted June 19th, 2018 at 6:50 pm | Log in to reply. Anyone else end up with just more than a cup of stock? I’m having to reboil the ingredients to hopefully make more, but I started with 12cups, might’ve gotten two? I’m from Connecticut and it’s the summer, so maybe those are my issues? If anyone else had this problem did you just add more water to begin with? Say 20cups? Posted May 13th, 2018 at 4:14 am | Log in to reply. Posted February 20th, 2018 at 5:57 am | Log in to reply. An older post but it looks delicious depending on the quality of Fish Cakes. Any chance I could get you to guess on the WEIGHT OF 20 LARGE ANCHOVIES? They are so varied in size. The ones I have in the fridge now are about 1 1/4 inches long, and I have no idea how many ounces 20 large ones would weigh. I do have shaved Bonita Flakes if that would be easier to figure. 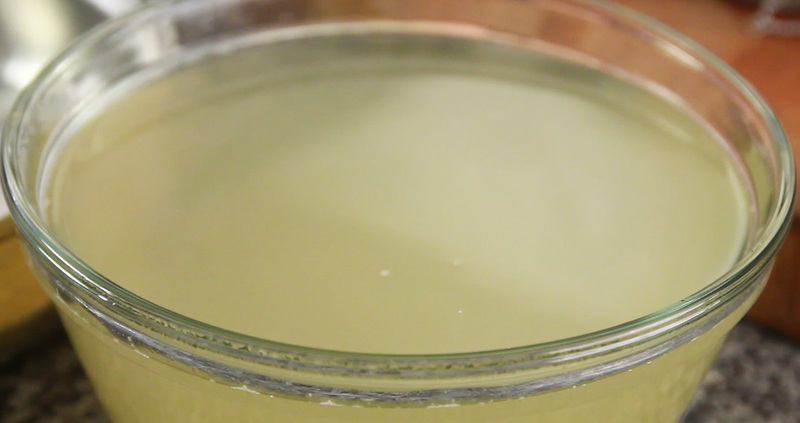 How many grams of Bonita Flakes would go into 12 cups of water to make a similar strength broth? Thanks. Love your You Tube videos and always let the commercials play all the way so you get the income. Also a subscriber on You Tube. Posted February 24th, 2018 at 10:57 am | Log in to reply. I just measured my anchovies. They are about 1 ounce, and the anchovies should be at least 2 and a half inches long to 3 and a half. Posted February 25th, 2018 at 12:58 am | Log in to reply. Posted September 20th, 2017 at 11:29 pm | Log in to reply. Posted September 22nd, 2017 at 9:21 am | Log in to reply. Posted February 26th, 2016 at 9:11 pm | Log in to reply. Why do you microwave the anchovies in this recipe? In some of your other soup or stew recipes, you just put the anchovies straight in to boil with the kelp. I don’t have a microwave – is there a big difference? Posted March 22nd, 2015 at 11:42 am | Log in to reply. Hi, Maangchi! Can I use salted kelp? Coz I can’t find any dried kelp so I just bought it. Thank you! Posted March 22nd, 2015 at 12:25 pm | Log in to reply. Posted March 22nd, 2015 at 12:58 pm | Log in to reply. Alright, also can you recommend a recipe using salted kelp? Thank yousm! Posted March 23rd, 2015 at 5:05 pm | Log in to reply. 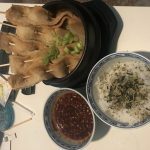 Check out my miyeok-julgi-bokkeum recipe. https://www.maangchi.com/recipe/miyeok-julgi-bokkeum Miyeok and kelp are different seaweeds but you can follow the recipe. 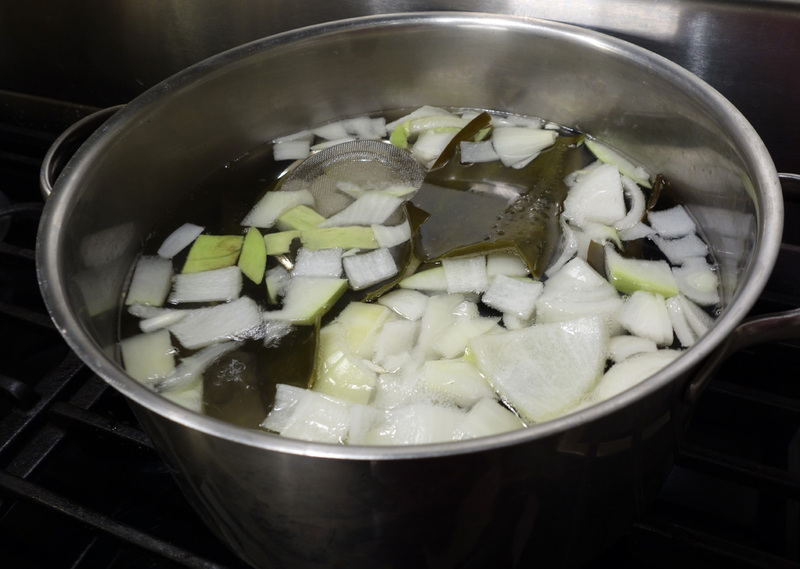 If the salted kelp is not shredded but wide, rinse it in cold water to remove saltiness, then blanch it in boiling water and rinse it in cold water again. Then make Yangnyeomchojang and wrap some rice with it. The recipe for Yangnyeomchojang (sweet, spicy, and salty sauce) is in my raw fish bibimbap recipe here. Okay, thank you Maangchi.. I cant wait to make this for my family. Posted February 15th, 2015 at 5:31 am | Log in to reply. Can I skip the kelp? Posted February 15th, 2015 at 7:59 am | Log in to reply. Posted February 19th, 2015 at 1:31 am | Log in to reply. Posted December 15th, 2014 at 11:04 pm | Log in to reply. Hello Maangchi: could you show me how to make “doenjang”? This recipe was originally posted on January 2, 2013 at 4:34 pm by Maangchi. It was last updated on October 5, 2014. The video was watched 1,730,444 times on YouTube & has 18,349 likes!